WEST WINDSOR – From jazz standards to the works of classical masters, music lovers will have both traditional and contemporary options with two free concerts by Mercer County Community College (MCCC) students. The MCCC Chorus will present its winter concert on Tuesday, Dec. 8 at 7:30 p.m., with the MCCC Jazz Band performing on Wednesday, Dec. 9 at 8 p.m. Both performances will take place in Kelsey Theatre on Mercer’s West Windsor campus, 1200 Old Trenton Road. 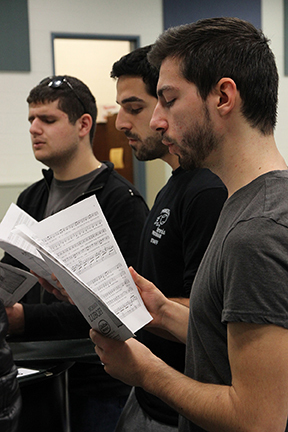 The MCCC Chorus, directed by Timothy Smith, will present a program entitled “All On A Christmas Morning,” which includes a variety of works by composers Benjamin Britten, Alfred Burt, John Rutter, and others. Wednesday’s performance by the MCCC Jazz Band, directed by Professor Bill Corvino, is a varied and exciting program for this year’s Winter Concert. The performance includes selections featuring the works of John Coltrane, Dizzy Gillespie, and Chick Corea, among others. All selections will feature standout improvisations by jazz students, who will be performing in small groups, as well as in the full band. Both concerts are open to the public. Kelsey Theatre is wheelchair accessible and free parking is available next to the theater. For more information, contact the Music Department during at (609) 570-3753. 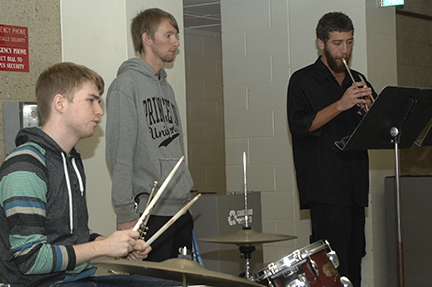 MCCC Jazz Ensemble students Thomas “TJ” Rickette, Aron Tankersley, and Bradley Gomez perform during the fall open house at Mercer. Stefan Neagu, and Connor DeVries during a rehearsal.